Batgirl doesn't usually take requests when it comes to her work. But when a local family recreation center finds itself besieged by a seemingly spectral figure, the threat to the community and the mystery is too much for her to resist. Of course Barbara Gordon doesn't believe in ghosts but can she get to the bottom of things with a clicks-crazy ghost-hunter getting in her way? 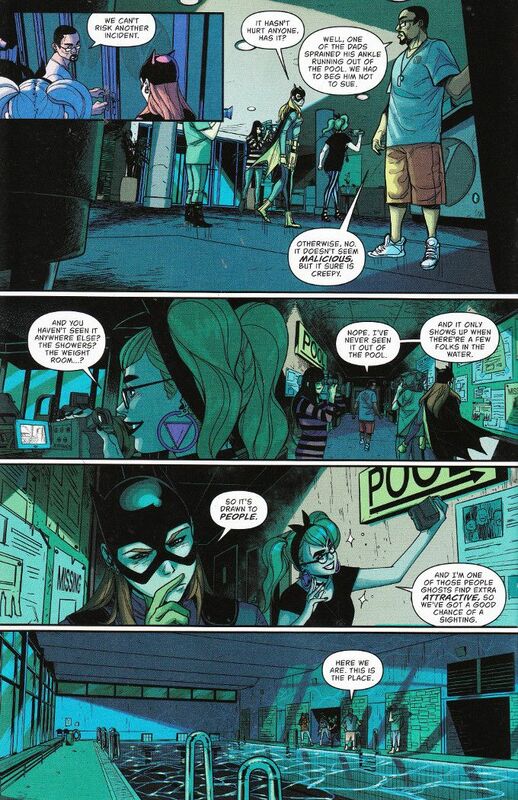 Batgirl #12 is easily the best one-shot comic I've read in recent memory. Hope Larson spins a riveting ghost story and it's an interesting twist to put Barbara outside of her comfort zone - both in operating publicly and throwing her against a seemingly supernatural threat. Still, Barbara's character comes out in subtle ways and the same idealism that made her seek training as a librarian to serve her community comes into play in this story. Eleonora Carlini's artwork proves the perfect match to Larson's script. I've greatly enjoyed Carlini's previous work on other series and her work here is up to her usual high standard. Colorist Cris Peter does a fantastic job varying the palettes based on location and time of day. A shame they aren't sticking around for next month but I hope these two are paired together again soon. The Final Analysis: 10 out of 10. A perfect entry point for those who have yet to give this amazing book a chance.